We agree with Nobel Prize-winning physicist Niels Bohr who said, "Prediction is very difficult, especially about the future." The good news is that successful investing doesn’t require the ability to predict the ups and downs of the stock market. It requires patience. Successful investing isn't about timing the market; it's about time in the market. Even if you had the ability to know exactly when the stock market was at its lowest point each year, making your annual investment contributions at those low points would make a surprisingly small difference in your long-term success. Let's look at how two very different investors would have fared over the course of 30 years from January 1984 until December 2013. We've nicknamed them Lucky Lew and Steady Eddy. Both invested $3,000 per year. Lucky Lew, a remarkable market timer, put all of his $3,000 into the market exactly at each year's low point. Steady Eddy put one-twelfth of $3,000 ($250) into his investment account at the end of each month — no matter what the market was doing. 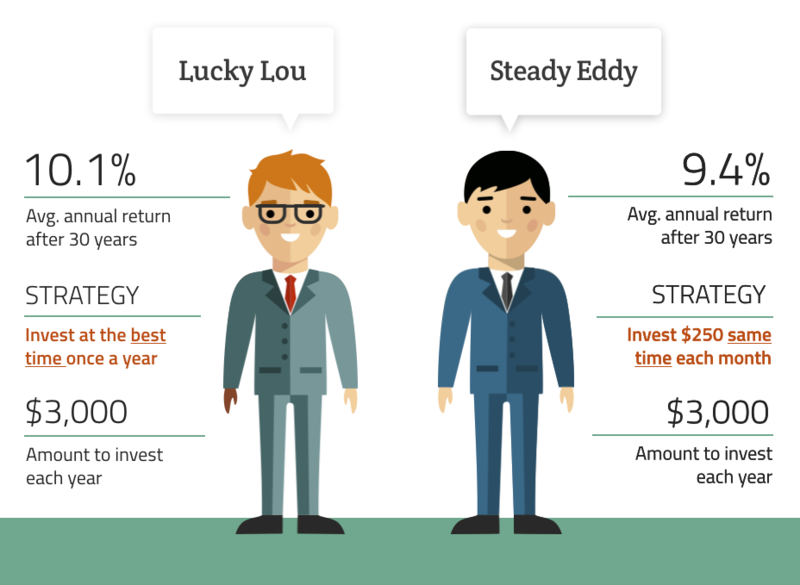 Over the 30-year period, market-timer Lucky Lew earned an average annual return of 10.1%. The average annual return for Steady Eddy, who made no attempt to time the market, was only slightly less: 9.4%. Lucky Lew got a surprisingly meager benefit for pulling off an unlikely (if not impossible) market-timing feat. But that doesn’t stop people from trying to time the market, even though abundant research shows the average investor significantly underperforms the market because of failed attempts at market timing. We suggest you tune out the market-timing noise — the constant chatter of stock market prognosticators — and stick with the plan we'll help you develop. You'll sleep better at night and your portfolio likely will perform better too.